The largest UK Mayfly. Patterns with inherent movement that can be twitched to induce takes from hesitant fish bring the best results. 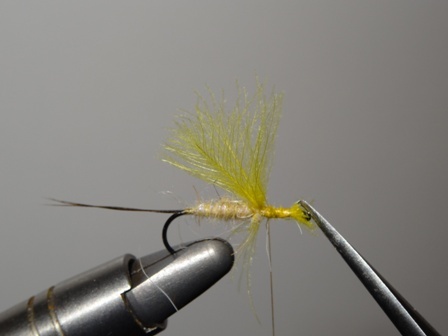 This highly motile pattern is relatively easy to tie and brings outstanding results on the stream. 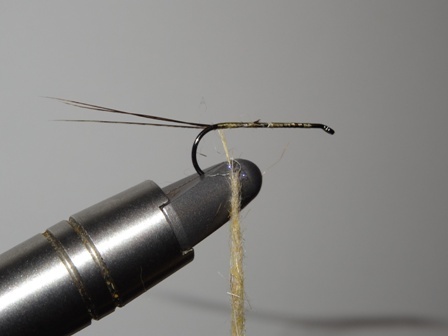 Tie in the thread and take to the rear of the hook (a long shank barbless pattern works best). 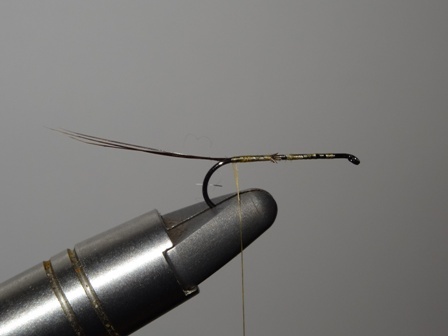 Select 3 dark pheasant tail fibres and tie in as shown. 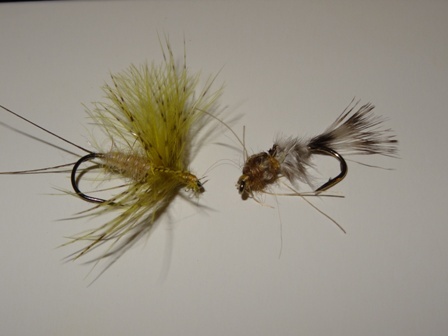 Dub on the UV hares ear plus or pearl hares ear plus (09 Tan available here). 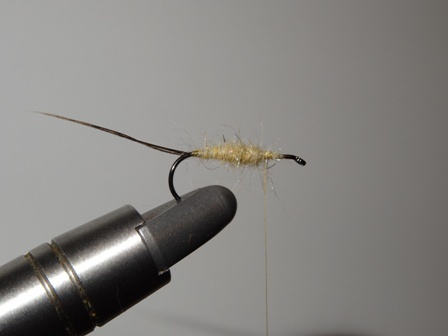 Form a nice tapered body with the dubbing. 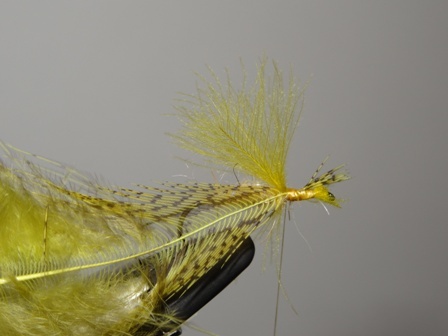 Pair two yellow/light green CDC feathers and tie on loosely either side of the hook shank. Adjust by pulling the stalks to get the desired shape and length of wing. 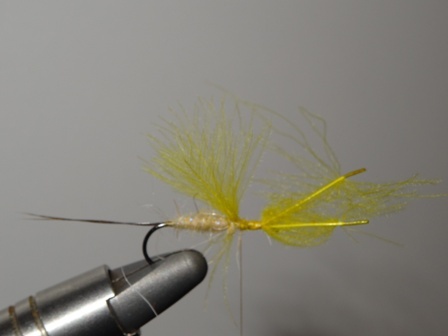 Tie the feathers tightly in position with turns in front and behind the feathers. 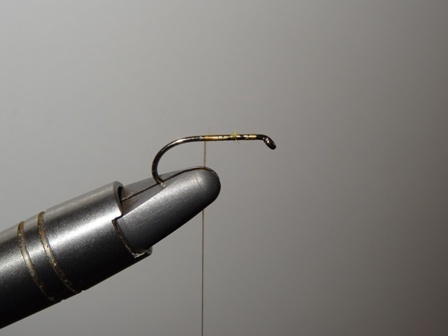 Pull the waste stalks to the eye of the hook and tie of very firmly with many turns of thread. 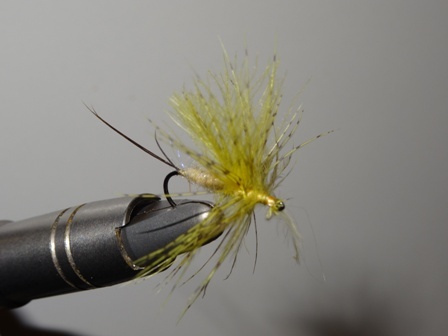 This prevents the CdC feathers being removed by trout teeth. 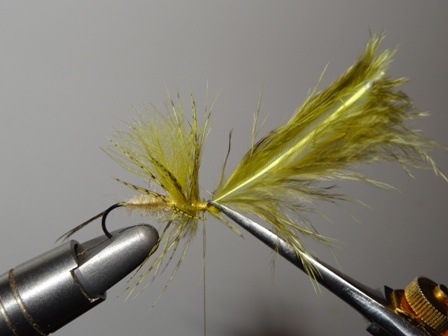 Tie in the tips of a large dyed green partridge flank feather. Wind the partridge towards the eye with the first turn behind the wing and two further complete turns in front of the wing. 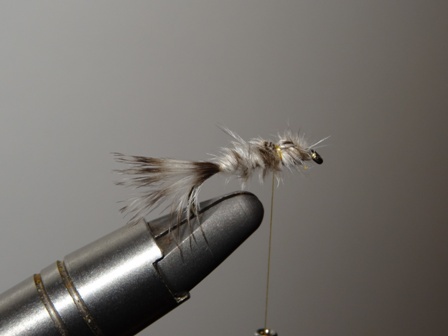 Tie of the partridge after the 3 full turns and whip finish. 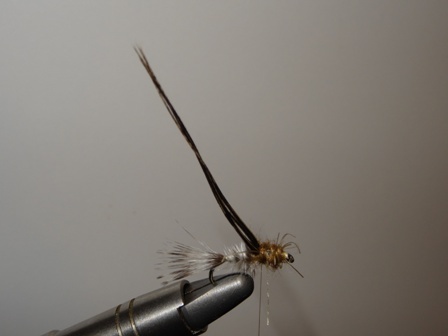 The Mayfly dun is complete. 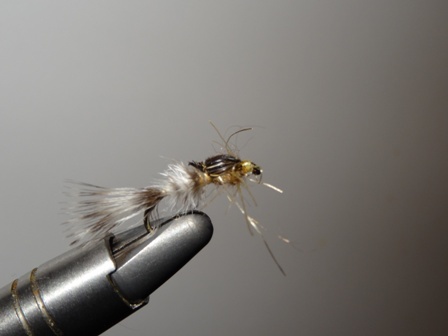 The nymph of the mayfly is seldom used but very effective. This pattern is a 3 minute tie but is full of movement and is highly suggestive of life. It holds my personal record for the highest number of fish caught in a single day. Catch in the thread. 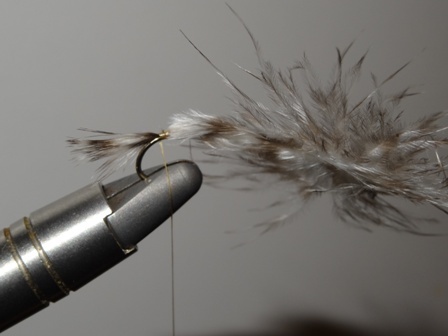 Select a natural grizzly marabou feather as shown. 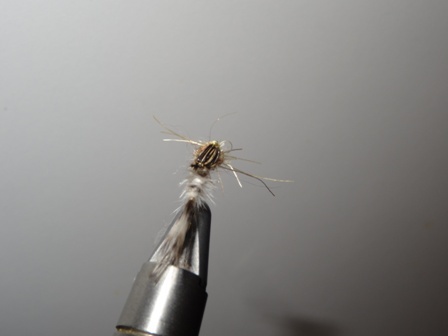 Tie in the tips of the feather to form the tail of the mayfly nymph. 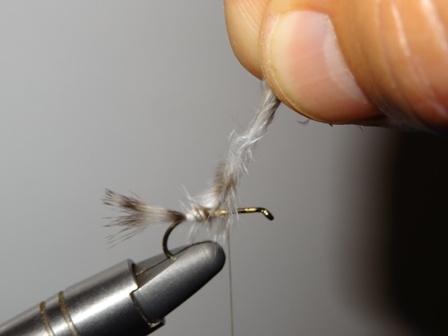 Slightly twist the feather and wind up the hook shank. 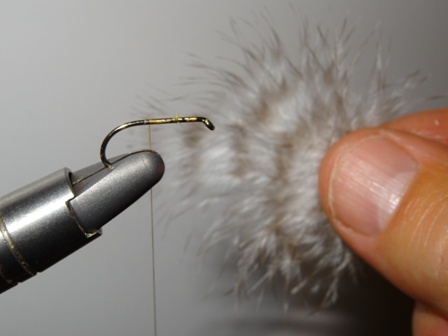 When the hook is covered with the marabou tie off and trim the waste. Take the thread back to form the thorax and wing buds. 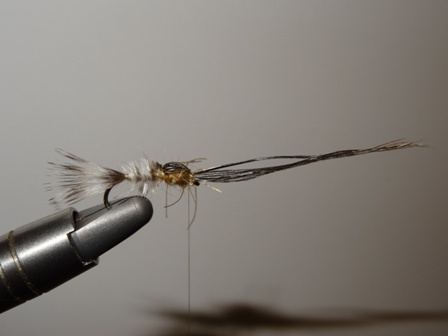 Tie in several fibres of pheasant tail to form the wing case. Dub on the thorax dubbing. This is Doug Swisher’s Generation X-treme dirty tan. This is a rubber leg dubbing with great movement. 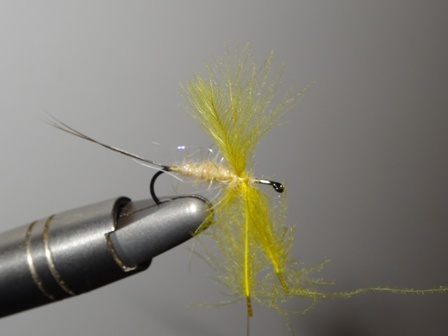 Take the pheasant tail fibres towards the eye and tie off to form the wing case. 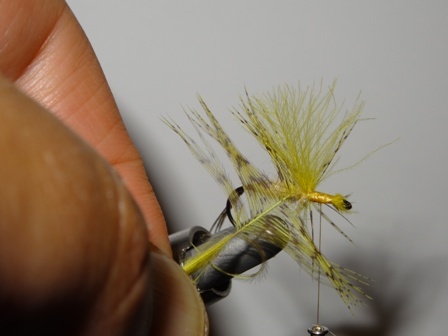 Trim the pheasant tail and whip finish the fly behind the eye. A fishes eye view of the nymph.